The Vietnam War, 1969. Deep in the jungles of Cambodia, a decorated colonel—along with his entire platoon—has turned his back on the Army, and Captain Benjamin Willard is dispatched with orders to assassinate the alleged madman. This mission, however, has far more in store for Willard than he could have ever imagined. Since its premiere in 1979, Apocalypse Now has been regarded as a pinnacle of filmmaking for its powerful exploration of war and humanity. Now, SMCT is bringing this iconic classic to the stage in a fully original adaptation. Apocalypse Now will stay true the film’s harrowing tale of madness and the horror of war while using the immediacy and intimacy of the stage to deliver a uniquely unsettling experience. Follow Captain Willard into the heart of the jungle, where he is destined to find himself face to face with the dark and brutal reality of human nature. SMCT is committed to exploring varied content in our shows, and supporting members of our community who have unique visions to share. 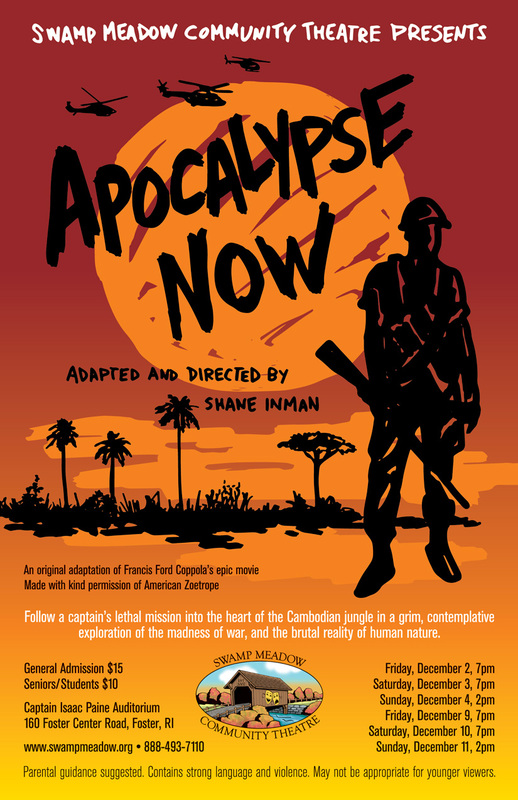 We believe Apocalypse Now is the kind of show that will have an impact on both the cast and the audience. Performances will be held on the first two weekends of December. Visit the Apocalypse Now Facebook page for a behind-the-scenes look at the production process. Read our press release, complete with photos. Tickets may be purchased with a Credit Card or Paypal using the selections below or by calling Brown Paper Tickets at 1-800-838-3006. Tickets may also be purchased at the door within one hour of the show. *Reduced rate, free admission are for regular plays only. They do not apply to Dinner Theatre, fundraisers and other events.